In, out, shake it all about... that's what I feel like singing today, as it's so sunny and gorgeous - bright blue skies and about 17 degrees, which is pretty unusual for this time of year! Sadly, I'm stuck inside, again. Worse than that, I've just had to console Sasha for the last half hour as she had got herself very stressed and upset about not wanting to go outside.... which doesn't seem to make much sense. I'll try to explain. 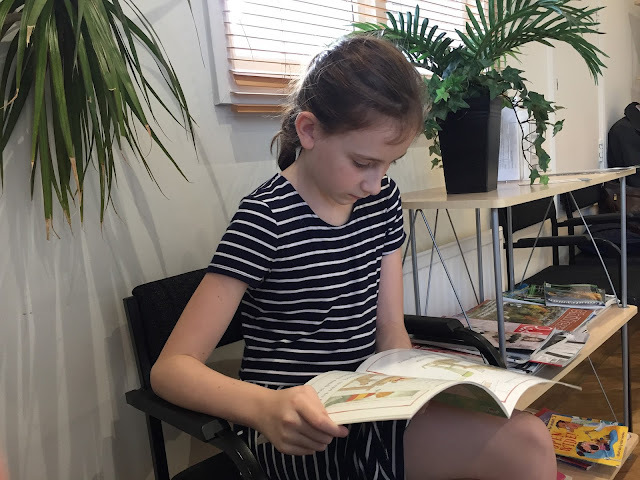 The other bit I loved about our trip to the dentist this morning was that Sasha willingly picked up a book in the waiting room. Twice. Of course they were books aimed at younger children than her, and she could read them easily but to me it was an achievement as she so rarely takes any interest in books. Anyhow we'd been out, we came back, Sasha went straight back to her bedroom and put her nightie on. Again, part victory, it's only in the last month or so that Sasha has started wearing clothes in the house, so it's nice to see her dressed at least. She's always seemed to have a very high resting body temperature, and that combined with the sensory issues and not liking seams or embellishments etc, has meant that she'd prefer to be in simple undergarments. Until recently, when the penny seemed to drop that she is growing up, and girls her age don't tend to hang around with no clothes on, even in their own home. After lunch I quickly walked Tamsin round to a nearby friend's house and I enjoyed my quick burst of fresh air. When I got back in, I suggested to Sasha, in a very nonchalant, no pressure kind of way, that it was lovely and she might want to go outside with me somewhere. Sasha loves nature, and loves being outside - once she is out. And that's the key part really. Getting out is such a struggle for her. She made it clear that she had only just got changed into her nightie and that she was back to the technology, so 'not now mum'. I said it could be in a while, didn't have to be straight away, whenever she was ready but of course if she left it until after tea then the sun would have gone. 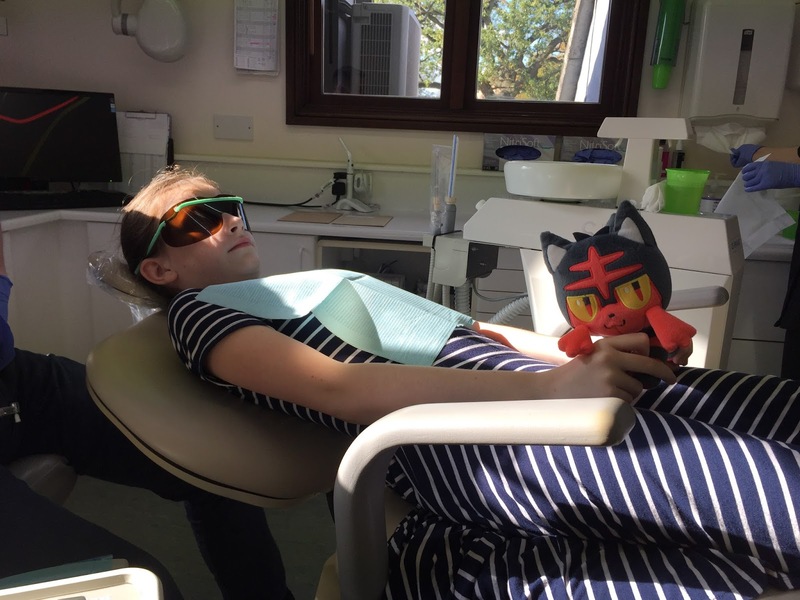 Because of the PDA (Pathological Demand Avoidance), I have to do all this in the lightest, breeziest tone possible, letting her know that it is totally her choice, maybe suggesting an option or two, but not really having a serious conversation about it, especially if she's already concentrating on the technology. Because she hates to be interrupted. So I left the room and resigned myself to indoor activities, making a cup of tea to settle down at the computer with. At which point she appeared downstairs, angry with me and herself, talking round and round about how she doesn't want to go out because she can't decide what to do. Of course by then any extra suggestions from me were met with a vehement 'no!' and there was nothing I could do to stop the cycle of pity and anger. I know, you see, that a large part of her does want to be out. She loves the smell of the fresh air, she loves kicking leaves, she likes the wind. She doesn't like lots of people and busy places, and she doesn't like to travel far in the car. So we are always limited. But I try, when I can. There's a great place nearby, a bluebell wood which has a den making area in it, and that has stoked her imagination occasionally. But not today. Sasha returned to her bedroom, crying loudly in a way that meant she wanted to be noticed. I took a deep breath and approached with caution. It's a bit like walking the plank and hoping you'll get a reprieve, but you're not quite sure how that could happen. So anyway I sat awkwardly on her bed and my cup of tea went cold. I let her rest her head on me as she sobbed about not wanting to go out, and I reminded her that I hadn't said that she had to go. That wasn't the point though, she was more upset with herself than anything. I knew it was the anxiety over not wanting to go, but at the same time not wanting to miss the chance of being out. Putting pressure on herself. Meanwhile, I have a million other blog posts to write... watch this space!